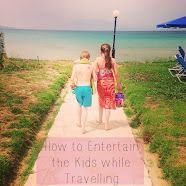 We eat out quite frequently as a family and I'm always on the look out for exciting new menus with lots of variety and healthy options for the children - I like to ensure they consume their five a day, or at least get somewhere near it, even when away from home. 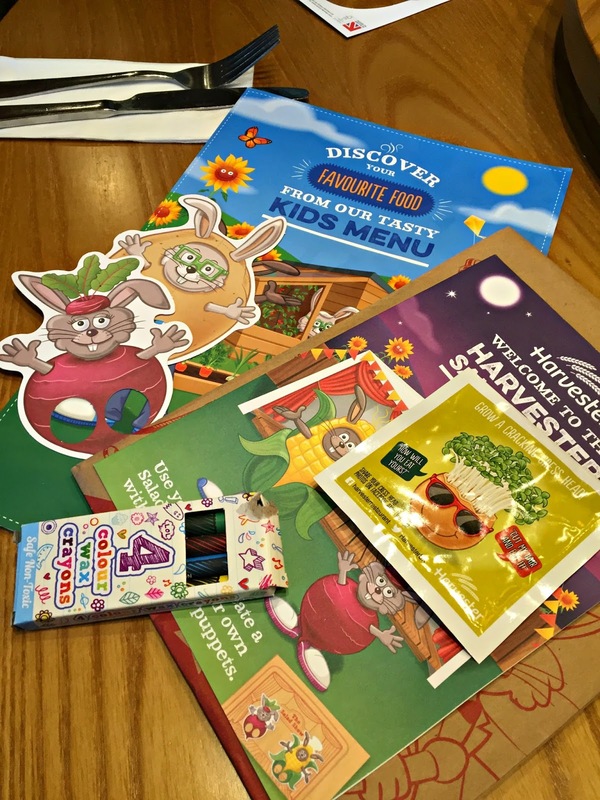 We have dined at Harvester restaurants a number of times over the years and we were pleased to be invited along to put the new kid's meals to the test. If it meant a night away from the oven and dishwasher then that's excuse enough for me but I was also eager to see the new look of the Grange Park branch after a refurbishment. We were welcomed and seated by Claire who was really friendly and pleasant to chat with. She talked us through the menus, took our order and directed us to the drink dispenser where we could help ourselves to unlimited soft drinks and to the salad bar which again is unlimited. One of the main things I like about Harvester restaurants is how you can help yourself in this way. 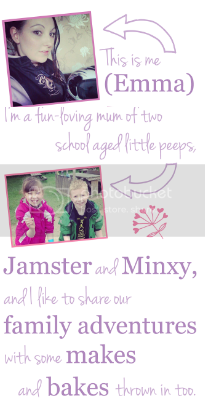 It gives the Mini Mes a little responsibility and freedom and when they get involved it also encourages them to try new things. You can choose what drink you would like, how much ice you want to add if any and the touch buttons make it really easy to operate. Similarly with the salad you can use the tongs and scoops to stock up on carbs like potato salad and pasta or fill up on lettuce, peppers and cucumber, with your favourite dressings - it's totally up to you. I was really impressed by the children's menu. Little ones can select a main and either 2 veg options or 1 veg with a side along with the salad bar for a set fee. There is 'Smaller Bites' option (£3.99) with a list of meals for those with tiny tummys (probably best suited for toddlers or pre-schoolers), 'Bigger Appetites' (£4.99) and then 'Harvester Recommends' (£5.99) which offers the larger meals more suited at older children. 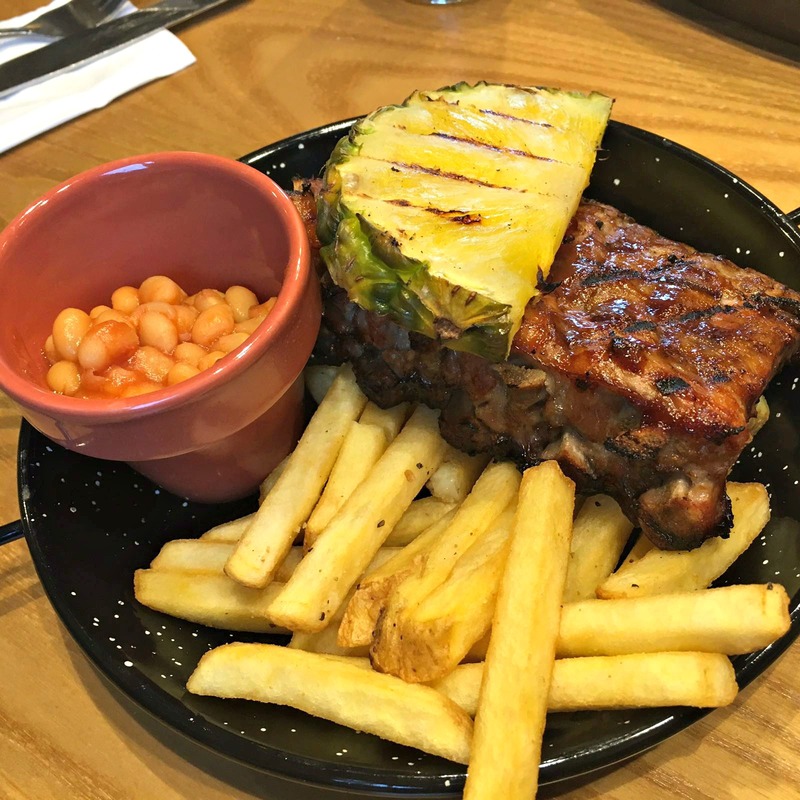 Minxy opted for southern fried chicken bites which she teamed with cheese and tomato rice and fresh vegetable sticks, whereas Jamster selected Harvester's Famous Ribs which come with a wedge of grilled pineapple and he chose fries and baked beans to go with them. Both really liked that some of the meal was served in small 'plant pots' and they each told me that the protein selected was incredibly tasty and juicy. On the reverse of the menu there is a list of desserts so while our empty plates were removed from the table the Mini Mes had a browse through the options while also taking a look through their activity packs which were provided upon arrival. These are a great way to keep kids entertained between courses with colouring pages, crayons and finger puppets being supplied and with each set coming in a brown paper bag you can easily collect the contents up at the end of your meal to take home - we used the cress seeds over the summer holiday. 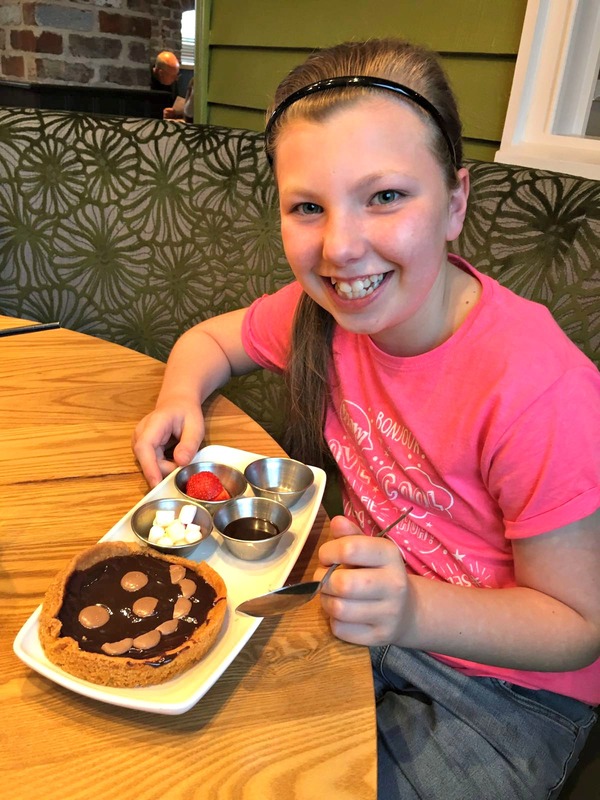 For dessert both children chose the build your own chocolate cookie pizza as they sounded incredible! The cookies come topped in a thick chocolate sauce and with little containers of marshmallows, strawberries, toffee sauce and Cadbury chocolate buttons. These not only tasted great (I did have a nibble) they encouraged creativity which I really like. Kids love to have fun with food so these were a great idea. Would we return to a Harvester restaurant? Most definitely. As well as the Mini Mes enjoying their meals the Mr and I thought ours (breaded button mushrooms, mac and cheddar cheese bites, triple chicken, 7oz gammon steak, sticky toffee pudding and a sundae) were delicious and incredibly good value. 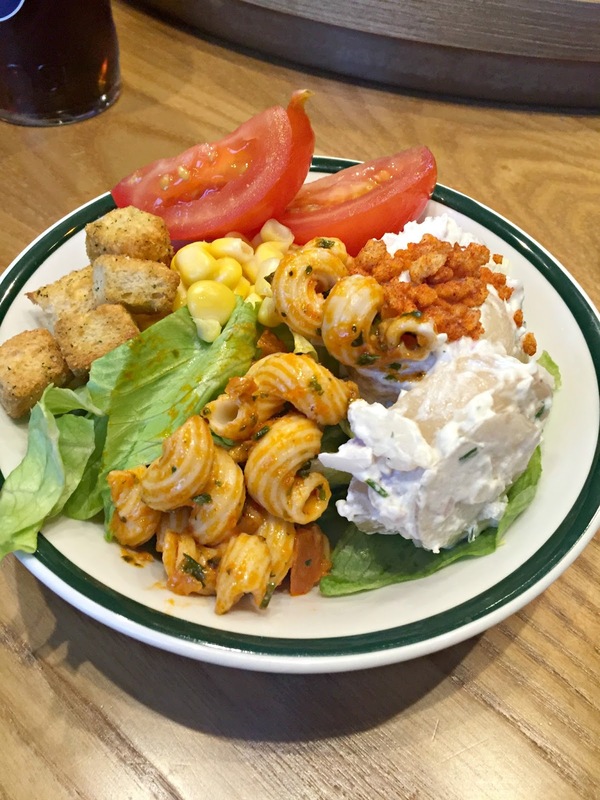 Have you been to Harvester recently? I haven't been to a Harvester in SO long and the children's menu looks amazing! I love the little freebies they got - my boys would be in heaven! This post has made me so hungry! We haven't eaten at a Harvester for years, I must find out where my nearest is as they're always good value. We don;t have any near us at all. We are in the middle of nowhere! Have enjoyed meals at Harvesters. Nice that they do some Special Offers on occasions. AS A VEGETARIAN I LOVE THE SALAD BAR AT HARVESTER, AND THEY EVEN HAVE A VEGAN OPTION WITH NO CHEESE!!! Looks great - we haven't had much luck with food at Harvesters but yours sounds much more pleasant. I love the harvester especially the salad bar! The food looks really nice, and now I'm really hungry lol. We used to visit Harvester a lot, but not in recent years as we have no transport and there has been no venue locally. However, one has opened up a few miles away, so we plan to go soon. Love their salad table, numerous ways to eat chicken and the generous portions you get for dessert! 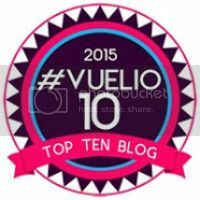 I love eating out with the family, it's such a lovely treat and a break from cooking for me! Sounds great! I haven't tried the food there yet, but I took my friends and their little one to our local Harvester for a few drinks and they accommodated us really well. We love eating out at our local Harvester. The menu's great and you always get a decent sized meal for your buck. It's a nice relaxing atmosphere too as lots of families dine there. I love our local Harvester- always good food and the salad bar is definitely the best bit! We love going to Harvester. Always lots of choice and family freindly way to get everyone out of the house rather than find childcare. Can't remember the last time I ate at Harvester. Will maybe try it again..
We often dine at Harvester as their menus are tasty and they aren't over priced too! Can't beat the salad cart! One of our local family pubs has just become a Harvester, I'll have to give it a try! 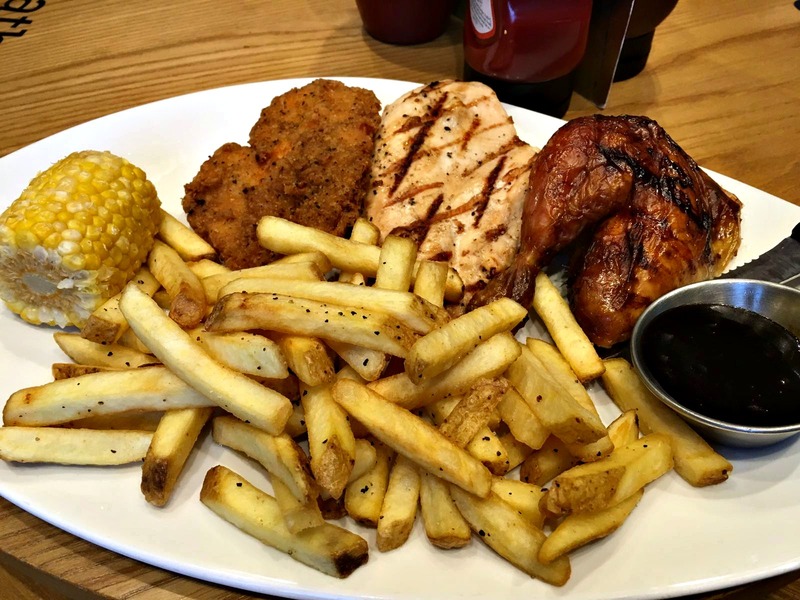 I have never visited a Harvester before, but after reading your review, which looks like you had an amazing time, plus the food looks fab, I will be going on their website to look for our nearest. It's been a long time since we visited a Harvester. Maybe we should go again soon. I love the Harvester....sadly our local one isn't close enough to visit as we don't drive. 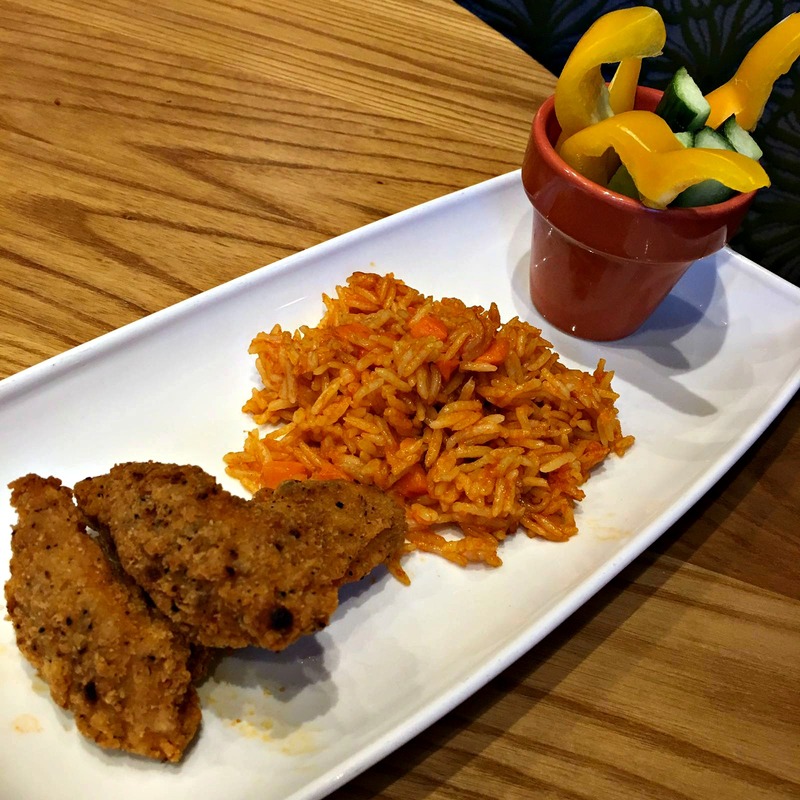 We often go out for meals at Harvesters and I agree - food is great and the atmosphere and family facilities is too! I have never been to a Harvester but all the food looks very tasty. I could just eat that chicken and rice! I do like Harvester, though a while since we have been. You have put me in the notion.